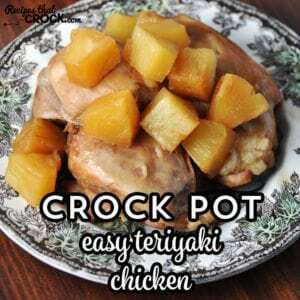 Easy Crock Pot Teriyaki Chicken - Recipes That Crock! Need dinner to cook itself and take less than 5 minutes to throw together, but not lack on flavor? 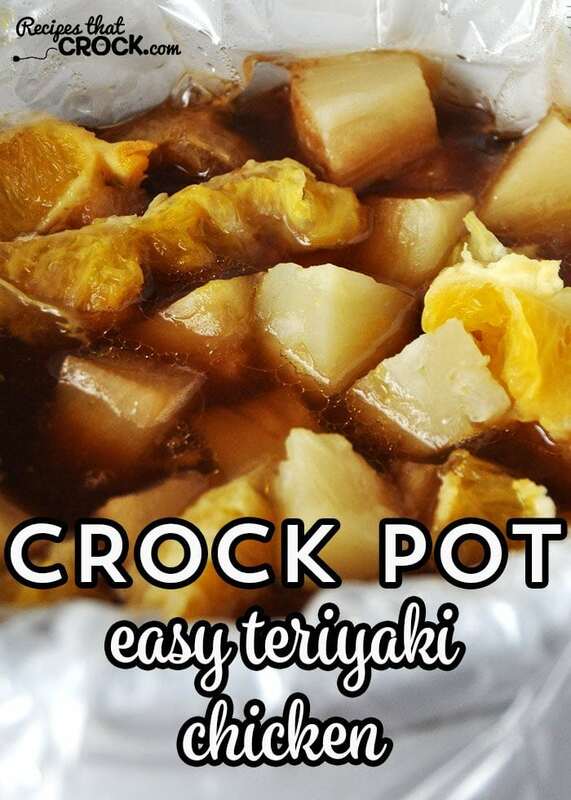 Then I highly recommend you check out this recipe for Easy Crock Pot Teriyaki Chicken. Life has been CRAAAAZY here lately. I seriously don’t know if I am coming these days. The times I have had to apologize for not being my best have been more than I can count. Have you every had one of those days? Weeks? Months? I’m not the only one right? That being said, providing meals for my family is something I do not want to fail at, and I’d prefer if they were pretty yummy while I’m at it. One meal that was a homerun around here was my Crock Pot Citrus Teriyaki Pork Loin. Michael raved and raved about it. The kids gobbled it up. I loved it too! I had some chicken in the freezer from an awesome Manager’s Special sale we caught at the store and inspiration hit! We thought Easy Crock Pot Teriyaki Chicken would be phenomenal! And boy were we right! This Easy Crock Pot Teriyaki Chicken is the perfect way to serve up some flavor with very little prep! This sounds really good. If you double the amount, do you double the length of cooking time as well? I haven’t made a double of this recipe, but would just use a larger crock pot if I did. You may have to adjust the time a bit, but it should be pretty similar with the larger crock pot. You will want to use a meat thermometer to ensure that your chicken is done, but not dried out. Our friend Marybeth actually has a great post over on Agricultured about using a meat thermometer to make sure chicken is done. I’ll put the link below. Enjoy! I have everything to make this. Reading my jar of teriyaki sauce/marinade, it is honey teriyaki sauce/marinade. Do you think the would work? I can’t wait to make it. I have never tried it with honey teriyaki sauce/marinade. However, if that is the type of teriyaki sauce/marinade that you like, I think it would work. Let me know how it turns out! Enjoy! So easy and looks delicious! It really is! I think I’m going to make a double batch next time so we can have more leftovers! Enjoy! OH I am making this tonight!!! Thank you!!!! I gave it 5 stars as it sounds yummy and easy!!! I hope you enjoyed this as much as we did! It was devored in my house! Enjoy!